We’d love your help. Let us know what’s wrong with this preview of Valour and Vanity by Mary Robinette Kowal. Acclaimed fantasist Mary Robinette Kowal has enchanted many fans with her beloved novels featuring a Regency setting in which magic--known here as glamour--is real. In Valour and Vanity, master glamourists Jane and Vincent find themselves in the sort of a magical adventure that might result if Jane Austen wrote Ocean's Eleven. After Melody's wedding, the Ellsworths and Vinc Acclaimed fantasist Mary Robinette Kowal has enchanted many fans with her beloved novels featuring a Regency setting in which magic--known here as glamour--is real. In Valour and Vanity, master glamourists Jane and Vincent find themselves in the sort of a magical adventure that might result if Jane Austen wrote Ocean's Eleven. To ask other readers questions about Valour and Vanity, please sign up. This kind of light fantasy fare is rather hitting the spot. Low effort, high Regency, light magic, and a little bit of woven magic changing perceptions and causing minor effects. It's really quite a bit of easy fun. Especially when we get involved with con-men in Venice and get thrown into instant poverty and the threat of debtor's prison. Woo, woo! Nice conflict. What are the Prince's illusionists going to do? Well, suffice to say, survival is of first importance, but a little bit of happy chance This kind of light fantasy fare is rather hitting the spot. Low effort, high Regency, light magic, and a little bit of woven magic changing perceptions and causing minor effects. It's really quite a bit of easy fun. Well, suffice to say, survival is of first importance, but a little bit of happy chance leads them all to get a bit of light revenge and comeuppance! Let's get creative with that magic, folks! Big publishers (like Tor, who published this book) have an annoying custom to let their marketing departments dictate their titles. Sometimes it works, but other times, it doesn’t. It didn’t work for this novel. The title the marketers came up with – Valour and Vanity – is too generic, while the novel is not generic at all. Its distinct writer’s voice, original magical system, and unique protagonists can’t be mistaken or even compared to any other in the fantasy genre. A fast and enjoyable read, Big publishers (like Tor, who published this book) have an annoying custom to let their marketing departments dictate their titles. Sometimes it works, but other times, it doesn’t. It didn’t work for this novel. The title the marketers came up with – Valour and Vanity – is too generic, while the novel is not generic at all. Its distinct writer’s voice, original magical system, and unique protagonists can’t be mistaken or even compared to any other in the fantasy genre. A fast and enjoyable read, this book takes place in Venice and on Murano Island a few years after the Napoleonic war. The undertones of Jane Austen and Regency romance, the author’s original inspirations, are unmistakable, but coupled with a peculiar fantasy twist and the allure of mystery, this story boasts its own quaint charm. A married couple in love, the protagonists Jane and Vincent are both artists, using the magic of their world – glamour – to adorn palaces and entertain the rich. Like any popular artists, they are not wealthy but not poor either. Now, they are taking a break from their artistic commissions and journeying to Murano, to check out the possibility of recording their glamour in glass. Unexpectedly, their exploratory journey turns sour. Attacked by pirates (are they really pirates?) and rescued by a kind gentleman (is he really kind? or a gentleman? ), they end up destitute and suspected of a large-scale fraud by the Murano police. Jane and Vincent try to figure out who is responsible for their predicament, try to find their way our, but neither is easy without funds. Unable to leave Murano or prove their innocence, they are left on the streets of a foreign city, hungry and cold. Extreme poverty is a novel and harrying experience for both of them. They know they’ve been swindled but they don’t know why and by whom? And they don’t have any money – neither for a hotel nor for their next meal and definitely not for a prolonged investigation. What are they to do? In the situation where hope seems elusive, their mutual love surges to the fore, the leitmotif of this book and of the entire series. Aided by their talents at glamour and their ingenuity, their love helps them deal with bad health and privations, suspicious Murano glassmakers and greedy swindlers. The heist, which crowns this novel, is a jewel of inventiveness, and like in any heist story, the Murphy’s Law is prevalent, but Jane and Vincent triumph nonetheless, beating the overwhelming odds and unscrupulous thieves. I love these protagonists. They are depicted with the honesty rare in the genre. Jane is a gifted artist in her own right, but her main concern is her husband, the arrogant and grumpy but super-talented artist-glamourist Vincent. When Jane briefly becomes the only bread-winner in their family, Vincent turns downright rude – not because he doesn’t love her but because it chafes his pride. How true! I love the quiet tone of this story, the slow buildup of tension, and the quirky friends the heroes accumulate as they struggle to untangle their enemies’ devious scheme. I love the antagonist, a smart and ruthless scoundrel with the propensity for playacting, a worthy opponent for our heroes. I love the absence of the standard Venice ambience of masquerades and swishing silk. The author shows instead the Venice stripped of her former glory by Napoleon, and the local people suffering under enormous taxes. No masquerades but survival is the key worry of everyone. The only thing I dislike in this whimsical novel of love and glamour is its abundance of glamour-specific terms. All of them are invented by the author and mean nothing to the reader, despite the glossary in the back. The novel is a stand-alone, but I wouldn’t recommend people unfamiliar with this series to start with it. Although it’s an engaging read, it is #4 in the series, and the pleasure of reading it can only increase, if you read the series in sequence, starting with #1 – Shades of Milk and Honey – which introduces Jane and Vincent. A must read for all fans of the series. "Jane Austen does Ocean's Eleven." Stop. Read no further. That is all you need to know about this book. If you have not read the first three Glamourist Histories books, go read them now just so you can read this book (you don't actually have to, but it makes for a richer experience, as with any series). In Valour and Vanity, Jane and Vincent, professional glamourists, journey to Vienna to hang out with Lord Byron (LORD BYRON) and continue studying Glamour in Glass (the technique, not the book). "Jane Austen does Ocean's Eleven." Stop. Read no further. That is all you need to know about this book. If you have not read the first three Glamourist Histories books, go read them now just so you can read this book (you don't actually have to, but it makes for a richer experience, as with any series). In Valour and Vanity, Jane and Vincent, professional glamourists, journey to Vienna to hang out with Lord Byron (LORD BYRON) and continue studying Glamour in Glass (the technique, not the book). But wouldn't you know it, they're attacked by pirates, robbed, and left to fend for themselves. More than any book in the series, I think, this book is very focused on plot, and the surprises start much earlier. With this book, Mary Robinette Kowal set out to write a heist novel set in 1817, and she succeeds with flying colors. I LOVE HEIST STORIES. I recognized many of the familiar tropes, and she made them work so naturally, taking advantage of both the specifics of her magic system and historical context. The cons, the disguises, the planning, the tricks, the chase, everything. It could have easily felt like a parody, an SNL sketch like "Canal's Eleven" or something, but instead it feels like this is what is happening in Jane and Vincent's world and boy does it resemble a type of story we see a lot of these days. The brilliance of these books is that Kowal writes historical fiction with a modern sensibility, and it feels true. It's as if she's having a conversation with history, filtering historical fiction as it's been told through a lens of historical accuracy backed up by copious research. Her characters encounter characters of color. Functionally destitute, they experience issues related to poverty that tend not to be written about. Everyone stars in a heist movie without realizing they're in a heist movie. There's something beautiful about the interplay between the past and present in the text. One thing I have failed to mention in my previous reviews is how surprised I am that Kowal got me to like Vincent so much. In the first book, he's mostly dark and broody, and I had no real affection for him as a character, but his relationship with Jane and his relationship with his family have made him a character just as interesting and appealing as Jane herself. This is the 4th book in the series and it continues to be a lot of fun. In this book we're following Jane and Vincent on a tour around the continent as they look for new ways to expand their work with Glamour and uncover new secrets to the magic they love so dearly. We're following Jane and Vincent as they are searching for Glassblowers in Italy to work with them and they hope to create something never before seen out of Glamour and Glassworks. However they receive quite a shock when all the Glas This is the 4th book in the series and it continues to be a lot of fun. In this book we're following Jane and Vincent on a tour around the continent as they look for new ways to expand their work with Glamour and uncover new secrets to the magic they love so dearly. We're following Jane and Vincent as they are searching for Glassblowers in Italy to work with them and they hope to create something never before seen out of Glamour and Glassworks. However they receive quite a shock when all the Glassblowers refuse to work with them and they are instead found by a man who turns out to be a sneaky thief and tricks them. With the help of a couple of local Nuns the couple are able to work their way through a very sticky situation, but it's a difficult one indeed and they are forced to lower their standard of living quite considerably. These books seem to be just perfect for my brain at the moment. I read this on the train, more or less in one gulp. You’ve got to love that one of the most important threads of the story is the love between Vincent and Jane, and how it gets them through everything, no matter what. And despite how far their acts of derring-do have come from their Austen-esque beginnings in Shades of Milk and Honey, the development is clear. This time, the trouble they get into grows out of everything before (rath These books seem to be just perfect for my brain at the moment. I read this on the train, more or less in one gulp. You’ve got to love that one of the most important threads of the story is the love between Vincent and Jane, and how it gets them through everything, no matter what. And despite how far their acts of derring-do have come from their Austen-esque beginnings in Shades of Milk and Honey, the development is clear. This time, the trouble they get into grows out of everything before (rather than being a whole new problem), which makes it tidier. Every book in this series pleases me more. Not just because this is a romance novel with a heist plot, WHICH IT IS. (She describes it as "if Jane Austen wrote Ocean's Eleven"). It reminds me very much of the TV show Leverage, but with glamour (magic in this world), pirates, Lord Byron, nuns, boat chases, and a stre Full disclosure: Mary is a dear, dear friend of mine, in addition to writing books that are aimed DIRECTLY AT ME as a reader. I would have a very difficult time not enjoying this book. Every book in this series pleases me more. Not just because this is a romance novel with a heist plot, WHICH IT IS. (She describes it as "if Jane Austen wrote Ocean's Eleven"). It reminds me very much of the TV show Leverage, but with glamour (magic in this world), pirates, Lord Byron, nuns, boat chases, and a street puppeteer. In Murano, which is like Venice only smaller. Just as importantly, we get to see Jane and Vincent navigate what comes AFTER happily ever after, which is the hard work that it takes to keep a healthy, loving relationship together, especially when setbacks and bad life things happen. They handle their challenges with the wit and grace you'd expect, and good humor, and more emotional honesty than you might think. I have come to love these characters, and I'm looking forward to book 5, Of Noble Family, which will close the series. Exciting installment. Jane and Vincent are off to Italy to hang out with Byron and work with glassmakers to perfect their technique of recording glamour in glass. But they become the victims of a very elaborate con. Honestly, it was very well done. After grappling with their victimhood for a bit, the married pair decide to fight back. They gather a group of comrades and co-conspirators and turn their own hands to creating a clever con of their own to turn the tables on their enemies. Very well done Exciting installment. Jane and Vincent are off to Italy to hang out with Byron and work with glassmakers to perfect their technique of recording glamour in glass. Very well done. I love caper and long-con stories. Especially when the good guys are the ones doing the swindling for justice. In this case it to so Jane and Vincent can repair their reputation and their lost money. And remain a loving supportive couple to boot. Jane and Vincent decide that in order to find more about glamour in glass they must travel to Murano but while crossing the sea they are attacked by pirates. Luckily they only loose their papers and belongings but when they arrive in Murano they found out that the attack was much more then they expected. I must confess the first half and maybe a little of the second part was quite interesting, only the ending bored me a little. I'm afraid this is it for me as far as the Glamourist Histories series goes. I cannot believe I'm actually typing these words after clinging to this series for so long despite not actually loving any of the books that followed Shades of Milk and Honey (#1), except maybe Without a Summer (#3) which I rated four stars. This book, however, made me realize that I didn't like the direction this series was taking, namely the whole constant travelling thing. If I wanted to read a fantasy novel about tra I'm afraid this is it for me as far as the Glamourist Histories series goes. I cannot believe I'm actually typing these words after clinging to this series for so long despite not actually loving any of the books that followed Shades of Milk and Honey (#1), except maybe Without a Summer (#3) which I rated four stars. This book, however, made me realize that I didn't like the direction this series was taking, namely the whole constant travelling thing. If I wanted to read a fantasy novel about travelling, I'd read The Lord of the Rings (which I love, mind you, so I'm not being sarcastic here). This series, however, was advertised as an Austen-inspired fantasy novel, and none of the books that followed Shades of Milk and Honey made good on that promise (except maybe Without a Summer, like I said). This novel follows Jane and Vincent as they travel to Venice, Italy, where they find themselves in dire straits after losing all of the possessions they took with them. The story begins with a bang, but after a while it loses steam, only to pick up at a later stage, by which time I no longer cared. On the outside, this book has everything: action, plot twists (not all of them predictable), new developments in Jane and Vincent's relationship... And yet I found myself yawning a lot of the time, and letting my mind wander to all the other books I would rather be reading. That said, this is not a bad book by any means, but it certainly was way too bland for my liking. I may continue on with the series if I happen to find the last book in a charity shop or something, but I don't think that's likely. I think I'll just pretend that the books after Shades of Milk and Honey never happened. Jane and Vincent are traveling in Italy with her parents, Melody and Melody's new husband. The time has come to part. While the Ellsworths, Melody and her husband will go on exploring the Continent, Jane and Vincent are headed to Murano to continue their experiments with glamour in glass. Mrs. Ellsworth is terrified their ship will be set upon by pirates. Jane is sympathetic but Vincent knows there's no such thing as pirates in this part of the world. Imagine everyone's surprise when corsairs attack and Vincent is hit on the head. A kind passenger, Mr. Sanuto, offers to pay their ransom. This rankles Vincent's pride and he promises to pay Mr. Sanuto back ASAP. When they arrive in Murano, they are given bad news. Lord Byron, who is to host them, is out of town and without letters of recommendation or money, they can not enter the country. With no money to return, what will they do? Mr. Sanuto offers his help again and allows the Vincents to stay with him in his home. The kind old man also helps them find a glassmaker who is willing to work with them. When Byron returns, the Vincents discover shocking secrets they never expected. Further troubles await them and Vincent is haunted by the inner demons caused by his father's abuse. Jane is haunted by the memory of her lost child and must come to terms with her feelings about motherhood. Finally, the Vincents and their new friends must use all their wits to launch a daring plan that will return everything to rights. This book is billed as a Regency heist novel. What is Jane Austen had written Ocean's Eleven? In that regards, the book is a big disappointment. It lacks the heart-pounding feeling of Year Without a Summer. The action starts and stops too often. The real heist part of the plot doesn't happen until the end. That part is exciting enough but I didn't really understand why the villains did what they did and why it was so important for Jane and Vincent to launch a heist. Much of the book is taken up with long, boring descriptions of glamour technique. I couldn't understand half of what they were talking about. Fortunately, there's a glamour glossary in the back to help. Also bogging down the plot are lengthy discussions that seem out of place in a period novel. Jane spends much of the first quarter of the book brooding over her miscarriage and talking with Vincent about conception and their feelings about parenthood. The discussion picks up again at the very end and it's so preachy and modern sounding. Also preachy is a discussion about who goes out to work and who stays home. I suppose it's an age-old discussion and within the context of the world of the novel it makes a bit more sense. If you like period details, you'll love this book because the whole middle section is nothing but detail. I really didn't need to know when Jane got her "flower" and what she does during that time. It was boring. Period details are great but they need to forward the action of the story not be dropped in just because they're cool. A brief mention would have advanced the personal side of the plot. Jane and Vincent and their relationship is at the heart of the story. At first I kept sighing about how much I love them together and how I adore Vincent. Then his moodiness and depression annoyed me, though I understand why he felt that way. I also got tired of him being so stubborn and ignoring his health. That got tedious after awhile but it does eventually prove important to the plot. Jane remains strong, brave and caring. She, too, is a bit stubborn but she knows when to give in. She's almost a little too perfect in this novel. The plot really illuminates just how talented she is. At least now she recognizes her talent and stops being so self-deprecating as she was in Shades of Milk and Honey. Melody has only a brief cameo and she manages to annoy me. She's a bit less selfish though. I was hoping for Melody and her husband to tag team with Jane and Vincent. Melody's magical talents were left undeveloped at the end of Year Without a Summer. So she needs glasses and can't see the threads of glamour without them. Can she see better with them? Is she talented too? We don't know because she's absent for almost all of the book. Mrs. Ellsworth is given a random backstory to make her more sympathetic. She's still irritating in a Mrs. Bennet sort of way. I'm not a mother so I suppose I can't understand her fears. I have little patience for nervous, hysterical sort of people (I'm sense like Elinor Dashwood and Jane Ellsworth Vincent and my sister is sensibility like Marianne and Melody). The new characters include Lord Byron and a friend of his. Byron would be astonished and pleased with all the adventures he gets up to in novels. Apparently this one at least is mostly period correct and uses his own words. His friend is apparently supposed to be a certain time traveling doctor from a TV show I've never seen so I completely missed the reference and didn't even notice the character at all. Other new characters include a bunch of mischievous nuns and their students. (Sister Act/Jane Austen mashup minus the singing). I really liked the Abbess. She wasn't what I expected based on my limited experience (and my dad's stories about Catholic grade school in the 1950s) with nuns. I had my suspicions about the villain in the beginning and then I thought something else was going to happen that sounded like more fun than what actually did happen. I was surprised at who the villain was when Jane and Vincent found out because it seemed more complicated that it actually was and there really wasn't a good motive there. The other villains are all basically supporting characters without much personality. There is one villain that surprised me. I never suspected or even thought about that person much at all. My suspicions were in another direction entirely. A pretty decent addition to the series although the ending was just too much of an infodump for me. I never feltI had a chance yon figure things out but rather it was all well you know here's what our plan was all along and oh yeah we figured out these details without letting you the reader in on how we did it. Also for some reason I found the interactions between Jane and David annoying. She expresses concern, he tells her he's fine, she gets frustrated and we repeat the whole series again, seve A pretty decent addition to the series although the ending was just too much of an infodump for me. I never feltI had a chance yon figure things out but rather it was all well you know here's what our plan was all along and oh yeah we figured out these details without letting you the reader in on how we did it. I thought both of the Vincents were a little irritating in this one, mostly David with his insistence that he was just fine. It wasn't really much fun until the end. Hope the next one is better. This glamour history eschews the usual Regency England setting for a more exotic locale: Venice after the dissolution of the Republic by Napoleon. Kowal likewise confronts our protagonists with new threats and new antagonists. The story has been compared to Oceans 11, but Kowal’s task was more difficult because she maintains a single point of view throughout, where modern swindler-the-swindler stories depend on multiple, rapid shift of POV. I feel like I enjoyed this book most out of the series so far. I usually have a bit of a problem with the pacing at the start of these books, but this time that was not the case. The story was compelling from the start, and had a few very nice twists and turns. I felt like I grew closer to the characters in a way, even if they frustrated me at times. I enjoyed seeing their struggles in this book, and seeing how they dealt with it. It was also a very clever book, especially the last part. I reall I feel like I enjoyed this book most out of the series so far. I usually have a bit of a problem with the pacing at the start of these books, but this time that was not the case. The story was compelling from the start, and had a few very nice twists and turns. I felt like I grew closer to the characters in a way, even if they frustrated me at times. I enjoyed seeing their struggles in this book, and seeing how they dealt with it. It was also a very clever book, especially the last part. Valour and Vanity is the fourth book in Mary Robinette Kowal's Glamourist History series, which I can officially say has really become one of my favorite series. In this book, Jane and Vincent travel to Venice, only to be robbed by pirates on their way. Left destitute, Jane and Vincent must depend on the charity of others to survive an reclaim their status. One of the things I really like about this series is the strength of its characters. Jane and Vincent are pretty much my favorite couple in f Valour and Vanity is the fourth book in Mary Robinette Kowal's Glamourist History series, which I can officially say has really become one of my favorite series. In this book, Jane and Vincent travel to Venice, only to be robbed by pirates on their way. Left destitute, Jane and Vincent must depend on the charity of others to survive an reclaim their status. One of the things I really like about this series is the strength of its characters. Jane and Vincent are pretty much my favorite couple in fantasy fiction, and even though this book brings us away from Jane's family, the new cast of characters (including an abbey filled with tough minded nuns, and a clever puppeteer) are just as memorable. I enjoyed how the series proves that you can tell a compelling romance story that goes beyond two people coming together, yet I also really appreciate the fact that there is more going on in these novels then just romance. Valour and Vanity explores the idea of poverty in great detail. Even in my worst times, things have never gotten that bad for me personally, but it still felt really authentic based upon things I've read and documentaries I've seen (especially the soap scene). The novel ends with an exciting heist sequence that had me eager to find more excuses to listen to the audiobook. Probably my favourite as far as the interactions and maturity and struggle in Jane and Vincent's relationship. Due to circumstances outside their control, an unjustice is done to Jane and Vincent that leaves them penniless and struggling to find work in a country they do not call home. In the end it is Jane who finds employment with the church and Vincent who is left at a loss to contribute funds. He falls into a depression as he struggles to reconcile his inability to be a protector, and proper Probably my favourite as far as the interactions and maturity and struggle in Jane and Vincent's relationship. Due to circumstances outside their control, an unjustice is done to Jane and Vincent that leaves them penniless and struggling to find work in a country they do not call home. In the end it is Jane who finds employment with the church and Vincent who is left at a loss to contribute funds. He falls into a depression as he struggles to reconcile his inability to be a protector, and proper husband, to his wife, having to rely on her wages to survive. It was a really interesting and almost modern situation where a woman is a bread winner (literally, in this case!) as opposed to a man and I really liked the dialogue it inspired and the strengthening of their relationship that came as a result. 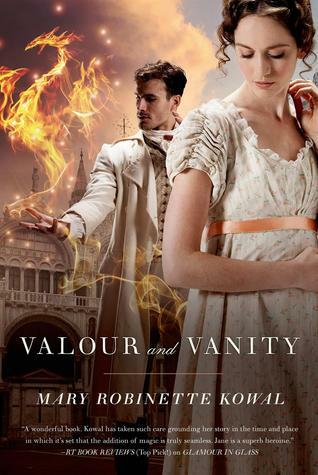 My review of Valour and Vanity, Mary Robinette Kowal's new fourth book in the Glamourist History series, is now up on the wonderful AustenProse website. I have thoroughly enjoyed the first three books of the Glamourist History series which has only gotten better as it goes on, but when I read the description of the fourth book I wasn’t positive that improving trend would continue, at least for me. Pirates? The Regency version of a heist film? Those may appeal to many but aren’t my prefe My review of Valour and Vanity, Mary Robinette Kowal's new fourth book in the Glamourist History series, is now up on the wonderful AustenProse website. I have thoroughly enjoyed the first three books of the Glamourist History series which has only gotten better as it goes on, but when I read the description of the fourth book I wasn’t positive that improving trend would continue, at least for me. Pirates? The Regency version of a heist film? Those may appeal to many but aren’t my preferred cup of tea. . . The blurb speaks truth. All you need to know to determine whether or not this book is for you is "Jane Austen does Ocean's Eleven." It's every bit as delightful as those five words suggest! I would recommend reading the prior three books in the series first, because they're excellent, and they're full of more instances of AWESOME LADIES BEING AWESOME IN REGENCY PERIOD-APPROPRIATE WAYS. I adore this series, and I adore Mary Robinette Kowal for giving us a courageous, intelligent, sympathetic, hero The blurb speaks truth. All you need to know to determine whether or not this book is for you is "Jane Austen does Ocean's Eleven." It's every bit as delightful as those five words suggest! I would recommend reading the prior three books in the series first, because they're excellent, and they're full of more instances of AWESOME LADIES BEING AWESOME IN REGENCY PERIOD-APPROPRIATE WAYS. With each entry in the Glamourist series, Mary Robinette Kowal keeps getting better and better. We the reader can enjoy a large cast of wonderfully drawn characters, a deep look at Regency-era society, military intrigue, the most intricate of daily life details, magic and wonder -- and here, a lovely spin on the caper novel. Not to be missed. Despite the fact that I generally am not a fan of heist movies (and similar-type books), I think this was my favorite of the series so far. Jane and Vincent have been accompanying Melody and her new husband on their wedding tour of the continent. Leaving the newlyweds with their parents, Jane and Vincent head to Murano. Lord Byron has given the Vincents an open invitation to visit him in Venice, which is a nice cover for what they what to do in Murano. They have long wanted to visit the famed glassmakers there after their discovery about weaving magic into glass to make it portable and not tethered to the earth. The couple hope that Jane and Vincent have been accompanying Melody and her new husband on their wedding tour of the continent. Leaving the newlyweds with their parents, Jane and Vincent head to Murano. Lord Byron has given the Vincents an open invitation to visit him in Venice, which is a nice cover for what they what to do in Murano. They have long wanted to visit the famed glassmakers there after their discovery about weaving magic into glass to make it portable and not tethered to the earth. The couple hope that with improved techniques they can get reliable results. Yet as Napoleon rallied and invaded Belgium when they were first experimenting with this idea, they are this time set upon by pirates who, while ransoming them and hence not enslaving them, take all their possessions and leave Vincent with a nasty concussion. Finding Byron away from home they are destitute. A kind man takes them in and gives them everything they could need till either Byron returns or they are able to alert their families. Only, sometimes kind men have ulterior motives and the Vincents could be in far more trouble then they could even guess. In fact pirates might be a welcome relief. There are few authors out there which I will drop everything for. Anything other then reading their newest book is considered nonessential. Phone calls go unanswered, emails pile up, work deadlines get stretched to breaking point. If it wasn't for the fact that food keeps me going and therefore keeps me reading I don't think I would remember to eat. Mary Robinette Kowal has become such an author for me. What began as a strong like has developed into a deep love with her Glamourist Histories. Any chance I get I'm recommending them to people and have so far converted quite a few of my bookish friends. My goal is for complete conversion (say it in a scary cyberman-esque voice). I think this goal is possible based on how these books have grown and developed over time. They are no longer just Jane Austen fanfic with magic, they're so much more! The books are part history, part fantasy, part alternate reality, there's just so much to love about them that I really can't stress enough that you should go out right now and get yourself all the books currently available, because the first won't be enough. But what is wonderful about Mary Robinette Kowal beyond her writing is that she interacts with her fanbase and while still maintaining the proper author reader relationship she opens up her writing and her process to her readers, giving them a glimpse behind the curtain. In this day and age if an author wants to create a lasting impression on a reader and fortify her following they couldn't do better then to emulate Mary. Back in November I was beyond thrilled because for NaNoWriMo Mary was looking for Alpha readers for the fifth installment of The Glamourist Histories currently titled Of Noble Family. I was doing little dances of joy when I was approved, but more then that, because I had read the series all along Mary included a copy of the forth book, Valour and Vanity. She sent me the email on November 14th and by November 17th I had already devoured every single line. I didn't think that she could surpass my love of Glamour in Glass, which is the second book in the series and my number one read of 2012, but I think she might have. The only problem I faced was that getting to read the next book, Of Noble Family, in installments wouldn't really work for my voracious appetite. So, showing amazing fortitude, if I do say so myself, I waited until the start of the Beta read and over another long weekend I took it all in. So why you're asking am I so enamoured of these books? Aside from the fact that I love anything Regency and Mary captures the feeling of the time period by sprinkling in historic details without inundating us with information, she has created a world where the magic just works. I'm not talking about works as in you say a spell and wow a light goes on, or even that it's successful in that something magical happens, I'm saying in the way she has created how magic is done just makes sense. The way magic resides in the ether out of the visible range and is brought forth and woven into something visible, either temporary or lasting, just works, it makes sense. Not just that, but as an artist myself, the way you think creatively, the way work takes a toll on you physically and mentally, Mary just nails it. There is such a simpatico going on between me and Jane with our feelings and our physical beings that I am right there with her every step of the way. While yes, there is this part of me going, Jane is me, there's a happier part of me going Jane is Jane. In the previous book, Without a Summer, I felt that Jane's voice was lost a little. She became more wishy-washy. She was constantly in doubt and lacked a spine. Here she doesn't just have a spine, she has spine enough for both her and Vincent, supporting them through their trials and hardships, making plans, taking names, befriending nuns, it's just perfect. "I do think you are beautiful. Not fashionable, not handsome, not insipidly pretty, but full of beauty. You find the beauty around you and reflect it for me to see. You are yourself, and you are my muse." One of the things I love most about this series, after the first book, is that it features the ongoing adventures of a married couple. That’s not something we always see a lot of here in fantasy-land, especially books that are a mix of fantasy and romance. And in romance-land the story often ends once our couple has found their ‘happily ever after’, choosing to leave the reader on a high note and overlooking any future relationship struggles our protagonists may have down the road. A lot of this One of the things I love most about this series, after the first book, is that it features the ongoing adventures of a married couple. That’s not something we always see a lot of here in fantasy-land, especially books that are a mix of fantasy and romance. And in romance-land the story often ends once our couple has found their ‘happily ever after’, choosing to leave the reader on a high note and overlooking any future relationship struggles our protagonists may have down the road. A lot of this book is centered on Jane and Vincent’s relationship as they go through a particularly difficult situation being trapped and nearly destitute in a foreign country with no immediate friends and no way to see to their needs. Obviously a stressful situation like this is going to have consequences on their relationship, especially when blame is being passed around in their own minds. Blaming themselves, maybe blaming each other for things because they’re angry at themselves… I have to say, everything here rang so true to me. As someone that’s been in a very long term relationship, this almost felt a little too real at times and I’ll admit that it made me uncomfortable to recognize flashes from my own relationship echoed now and then in the arguments. But, I think it’s fairly normal that couples will argue sometimes, especially when under duress. How Jane and Vincent’s relationship is strengthened by going through this ordeal also rang very true to me. And for all that, this book is not a romance, it’s very much in the fantasy genre. Sure this one featured more slice of life fantasy, but the main plot of the book is Jane and Vincent’s ongoing work with Glamour and developing new techniques through the use of glass globes. This is why they’ve come to Murano after all, for work. There’s pirates, betrayal, and an intricate plot to be uncovered. There’s also a rag-tag group that forms to steal back secrets and set out to prove Jane and Vincent’s innocence. I loved all of the side characters that they became friends with and helped them out along the way. And I especially enjoyed the little bits of heist thrown in later in the book. Also, Lord Byron is floating around in this book (sometimes quite literally). So there’s that. There’s also some great commentary in here smoothly interwoven into the story about women and men’s roles in society, and also about refugees and how people can suddenly find themselves in dire straights with no one willing to help them. One of the things I found most interesting is when Jane herself has a moment of sexism, assuming at first that a fellow woman in a glass maker’s shop is a mere assistant instead of practicing the art herself. Jane is taken aback by her own thinking after her mistake is pointed out and I think it’s a sign of how pervasive some thinking can be in society, that it takes years of change before the underlying consciousness catches up to what is ‘normal’. This 4th episode takes us to Venice, specifically Murano, for a way to make glamour more permanent. Capturing the illusion in glass as a method. Fake pirates and other misadventures ensue. Another entry in Mary's "Jane Austen with magic" series, this one is much more of a romp than the previous three. Fun read, but if she never uses the word "nuncheon" again, I will be quite relieved. I continue to adore these books. That's all you really need to know, right? Valour-and-VanityThis is the fourth book in the Glamourist Histories, in which Mary Robinette Kowal creates an alt version of the English Regency period and gives it 'glamour', a form of magic that is generally used to decorate the sitting rooms of the gentry but which can also (we discovered in the last book) be used to create cold, and which maybe just might have military uses as well. I think this book could stand by i I continue to adore these books. That's all you really need to know, right? Valour-and-VanityThis is the fourth book in the Glamourist Histories, in which Mary Robinette Kowal creates an alt version of the English Regency period and gives it 'glamour', a form of magic that is generally used to decorate the sitting rooms of the gentry but which can also (we discovered in the last book) be used to create cold, and which maybe just might have military uses as well. I think this book could stand by itself - glamour isn't that hard to comprehend and the relationships between the two main characters, Jane and Vincent, and their respective families are both spelled out and not vitally important to the plot. But of course, WHY would you want this book to stand by itself? Just read all of them! If you haven't yet read the series, there was a spoiler in the first paragraph - sorry - Jane and Vincent end up married. But come on, this is an historical romance with magic; yes I'm sure 'grimdark' has made its mark on that genre somewhere, but it's not here and that's quite nice, thankyouverymuch. So things generally end up nice at the end... but if you've never read this genre and you assume this means everything is always roses, HECK NO. Kowal is quite happy to put her characters through very nasty events. Here, Jane and Vincent are off to visit Murano (near Venice) to visit the glassblowers, but their ship is hijacked and they end up penniless in Murano. In a world without fast communication or access to emergency funds, in a country where they know no one. They've never been filthy rich, but neither of them have ever struggled like this before. There are many things I loved about this novel. 1. Jane and Vincent's relationship. How often do we get beautiful, complicated married relationships at the core of a story? Where although they're hitched, there's still romance... and where complications are real and frightening but working them out is a real and worthwhile goal. I just love this portrayal of love in marriage, not least because it's not perfect. Both of them do detrimental things, but it's not the end of the world - and it's not simply ignored, either, but worked out and worked through. 2. Jane. Jane Jane Jane. Determined, fragile, strong, plucky, innocent, smart. And with marvellous flashes of feminism - she knows Mary Wollstonecraft, hurrah. 4. The prose. It's delightful and ever so readable and captures the places and people beautifully. I don't love fashion - I'm closer to Vincent than to Jane in my reaction to the necessity to purchase clothes - but Kowal's attention to detail and simplicity of description amuse even me. 5. It's not the same as the others. I'd probably still read it, even if it was the same sort of adventures over and over again, but it's not. Well, there are similarities - difficulties to be overcome, new people to meet and either befriend or contend with - but Jane and Vincent do actually grow and develop over time, and the sorts of problems they face are also different. 6. Issues. This series makes no claims to tackling major issues, but they certainly do not ignore them. The class issues have been present, sometimes as undercurrent and sometimes overtly, from the start - never solved, but certainly problematised. Race appeared as a serious issue in the last book and is acknowledged here as well. Gender is always an issue; that Jane is competent and works as a glamourist, that Vincent is excelling in a traditionally feminine sphere - both of these continue to be part of the complex society presented, along with other problematic aspects of gender relations in the period. I like Kowal's writing style, but she seems to like to pick plots that don't work the best for me. See, I have a few plot elements that I find very hard to read, and one is when the main character/s are being falsely accused of something. I don't know why, but the unfairness of those situations makes me uncomfortable and not excited to keep on reading. This plot element was present in both this and the previous book in the series! Theoretically, I should like these books a lot more (regency fantasy! ), but I can't. I just squirm in my seat when people in power don't believe what the characters are telling them.